Under the Kyoto Protocol, rich polluting nations can ‘offset’ their carbon profligacy by – among other measures – paying poor countries to plant trees. 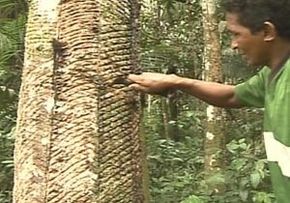 In many cases this Clean Development Mechanism has led to deforested areas being planted with just one or two species. These biologically poor ecosystems do not provide the same level of ‘biological services’ – freshwater provision, local climate control, etc. – as native forests. Yet there is currently no mechanism under the CDM to pay countries to prevent deforestation in the first place. This is increasingly seen as perverse or incomplete accounting: if the destruction of Indonesia’s forested peatlands is taken into account, it becomes the world’s third biggest carbon polluter. And a growing lobby is calling for the CDM to be expanded to reward developing nations for preserving their forests. In Brazil, one hectare of tropical forest is worth around US$200 – US$500, if cleared for pasture. Current prices on the carbon market would give it a value of US$4,000 – 10,000. In this programme, we hear from some of those seeking to incorporate standing forests into the CDM. And we glimpse a possible future in the Brazilian state of Amazonas, which is spearheading a move to expand the market to incorporate the value of forests as providers of rainfall and havens of biodiversity, as well as carbon sinks.